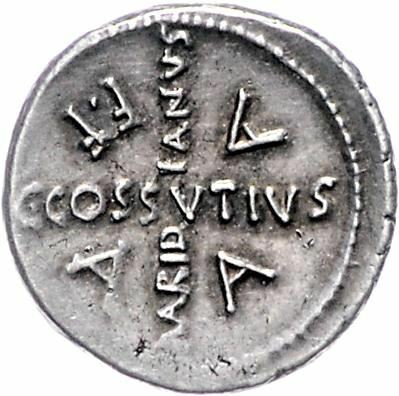 C. Cossutius Maridianus was one of the moneyers for the year 44 BC, and struck a number of issues jointly with Julius Caesar, as well as some alone. Gens Cossutia was a plebeian family of equestrian rank at Rome. It never attained any importance. It is conjectured by some from Cicero's mention of the Cossutianae tabulae, near Caesena, in Gallia Cisalpina, that the Cossutii originally came from that place. On coins of this gens, we find the cognomens Maridianus and Sabula, but none occur in history.